The digital marketing industry is currently on show at DMEXCO 2018. We share a brief overview of our experience of day one. This year DMEXCO’s conference is built around the concept of taking C.A.R.E (Curiosity, Action, Responsibility, Experience), a golden maxim for today’s exciting yet challenging digital marketing climate. We see these values front of mind across the panel discussions and presentations as marketers ask themselves about the actions they can take to drive the industry forward and how they can leverage new technologies to become better at what they do. AI, blockchain and data privacy were all topics that featured heavily on day one of the conference, with a great emphasis throughout on the need to win customer trust. Not only are the after effects of the Cambridge Analytica scandal still being felt but this is the first DMEXCO to take place post-GDPR. Much debate has centred around the customer journey and the correct ways to use data to personalise customer experiences. The phrase ‘digitisation of humanity’ has been cropping up in presentations throughout the day with speakers keen to focus on how digital technology is affecting human beings. The importance of the human element of marketing is a key theme. If you take C.A.R.E, you innovate and progress at the same time as showing the customer empathy and understanding. Last year, the conference was criticised for a lack of diversity on many of its panels. In 2017, only a third of all speakers were female. With almost 300 speakers at this year’s conference, the hope would be that the conference organisers would address that imbalance, as well as the under representation of ethnic minority tech talent. Yet, it has again fallen short. Yesterday, on the first day of the conference, of the 45 speakers on the Congress Stage, just 11 of them were female. Ironically, 4 of those 11 were taking part in a panel discussion on the topic of diversity strategies within business. The issue appears to continue into the second day of the conference, where only 8 speakers on the Congress Stage are women. The conference does feature inspiring female speakers such as Debora Koyama (CMO, Mondelez Europe), Alicia Hatch (CMO, Deloitte Digital), and Nikki Mendonca (President, Accenture Interactive Operations) but it feels like a real missed opportunity to have not come further. While DMEXCO proves it can still pull in the brands it appears it hasn’t quite managed to attract the big names. Last year’s conference boasted both top P&G marketer Marc Pritchard giving powerful advice on tackling industry challenges and a memorable face-off between Martin Sorrell (then CEO of WPP) and Twitter founder Jack Dorsey (where the former poked fun at Dorsey’s pyjamas). While the Unilever’s, WPP’s and P&G’s of the world are still in attendance, there seemed to be a conspicuous lack of brand heavyweights at this year’s conference. After the organisers fired conference co-founders Christian Muche and Frank Schneider last year – following a significant 22% fall in attendance to just 40,000 visitors – there were rumblings around further declines in attendees. It was hinted that there might not even be a DMEXCO this year. It’s good to see that the chatterings didn’t live up to the hype and the event has reasonably crowded stages and an even busier expo floor. But it will be interesting to see the final attendee numbers when they are released after the event. The size of the Salesforce ‘booth’ (if it can even be called that) would make your average London flat look small, and Google’s could probably rival the floor space of a sizeable townhouse. 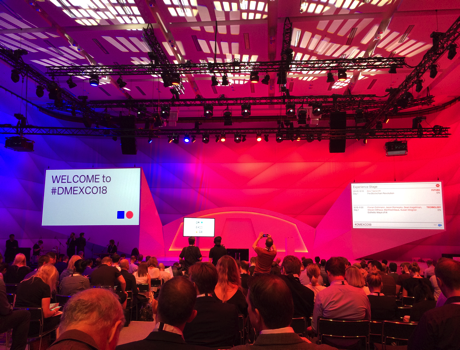 Looking around the event, you wouldn’t believe that just a few months ago there was talk of DMEXCO 2018 being cancelled. The halls are heaving and there is still a definite buzz about the event – #DMEXCO18 was reliably trending on Twitter in Germany throughout the day yesterday. It’s clear that the big brands still see value in being at the event – and where the big names are, marketers are sure to follow. It’s been a thought-provoking and interesting day one of DMEXCO 2018 – we’re looking forward to day two!